Official launch of a major new publication Scaling up investment for sustainable urban infrastructure: A guide to national and sub-national reform. The creation of clean, compact, and connected cities can stimulate job creation and economic growth, improve air quality and living standards, and avoid the costs of sprawl - all while reducing carbon emissions. However, the sustainable urban infrastructure financing gap currently exceeds $1 trillion per year. Join us for a lively discussion on the means and methods of addressing this critical gap. 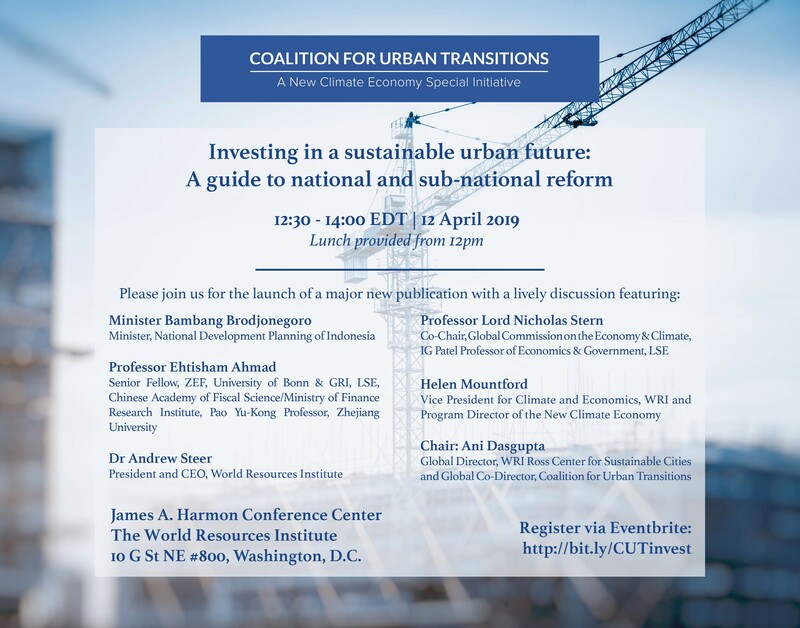 This event will be the official launch of a major new publication Scaling up investment for sustainable urban infrastructure: A guide to national and sub-national reform co-authored by the London School of Economics and the Coalition for Urban Transitions. This event will commence at 12.30pm EDT. Please join us from 12:00pm for lunch.